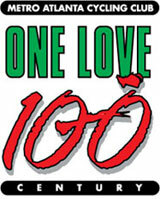 ONE LOVE!! Metro Atlanta's best charity bike ride is only a few summer weeks away, and we can't wait for you to join us. Great roads. Better food. Not much traffic. And 1,000 of your best friends riding through the isolated roads of South Fulton County. If you've done it before - welcome back! If you have never been part of the One Love Century, come join us in 2018 and experience our new expanded weekend format! Options: 16, 27, 43, 61 & 101. The well-marked courses traverse rolling terrain through rural communities and horse farms in South Fulton, Rico, Palmetto and Coweta County. Proceeds go to organizations that promote cycling for inner city youth. Fee Includes: cue sheets, super good maps, T-shirt, rest stops, and post-ride party. THE ONE LOVE CENTURY is more than just another century ride, it is ‘the best value’ you can find for a charity ride in Georgia, also it is an opportunity to make a difference in the lives of local youth through your participation. Proceeds from the event help support the BRAG Dream Team, East Atlanta Kids Club, and the DLV Youth Cycling League. We have also contributed to local cycling scene through WeCycle Atlanta, an organization helping to get the community more active through volunteerism and cycling. "Please understand that the One Love Century is a rain or shine event, and that we won't be able to provide refunds due to weather. Thanks for your understanding, and we look forward to seeing you at the start of this great event!"